Staff is studying the feasibility of a 0.8 mile long, 12-foot wide urban trail and associated stream improvements of Shoal Creek from Fifth Street to 15th streets. The trail is intended for active transportation and recreation users of all ages and abilities. We aim to make the trail link to the on-street bicycle and sidewalk network; include amenities and unique features; create a safe, environmentally sustainable destination; and preserve and improve the wildlife habitat. 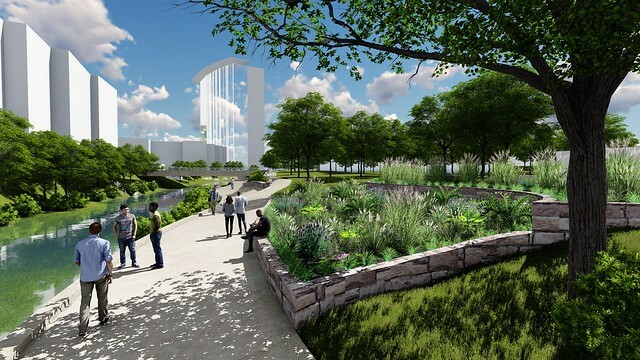 The preliminary engineering report (PER) will provide recommendations on how this urban trail can encourage non-vehicular mobility, connectivity and improve the health of Shoal Creek. The preliminary engineering report will also explore widening the existing trail and adding creek crossings while preserving, protecting and improving environmental conditions along the creek corridor. The preliminary engineering will include data collection, engineering analysis, stakeholder feedback, site assessments, preliminary design development and cost estimates required for final design and implementation. This project is currently in the outreach and development phase. View the video from the August 17, 2016 public meeting. | View the presentation from the public meeting. View online feedback on SpeakUp Austin! Below are project renderings that show what the trail may look like and what features it may include. For more information, please contact Project Manager William Power at william.power@austintexas.gov.